The Wolverines are not into taking the easy route. 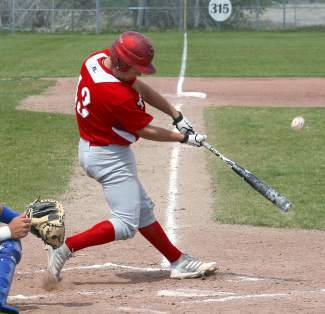 One loss away from elimination, the defending state champion Truckee baseball team scrapped its way out of the loser’s bracket of the Northern Division I-A regional tournament in Elko this past weekend to earn the final state championship berth. Truckee, which entered as the No. 4 seed, opened the double-elimination tournament with a heartbreaker loss to top-seeded Elko, 5-4, on a walk-off single in the bottom of the seventh. That sent the Wolverines to the loser’s bracket, where they squared off against second-seeded Lowry — which opened with a 10-1 loss to third-seeded Fallon. Truckee got past Lowry 12-9 before eliminating Fallon 9-8 in a must-win game, which placed the Wolverines in the regional championship against the Indians. With their pitching depleted, the Wolverines lost 13-2 to Elko in the title game. But it didn’t matter. The Wolverines had already punched their ticket to state. The Wolverines faced an uphill battle after dropping their first game against Elko, which jumped out to an early lead and held Truckee off the scoreboard in all but one inning. In fact, Indians starter Dalton Ridgway remained perfect through four innings of his complete-game win. Truckee finally made some noise with a four-run rally in the fifth to break up the perfect game and take a 4-3 lead. But it was short lived, as Elko knotted the score in the sixth before walking off in dramatic fashion in the final inning. Holmer exited after throwing 91 pitches in four innings. He allowed three runs on five hits and three walks while striking out six. In Truckee’s big fifth inning, Jackson Rohlf got the Wolverines started with a single to left, and Chris Towle reached after being grazed by a pitch. Holmer followed with an RBI single, and Towle came home on a ground out by Travis Ferre. Holmer later tied the score at 3-all after a balk call. Bradley VanSchoonhoven singled to right to keep the inning going for Truckee, and Aaron Pado came up with the go-ahead RBI single. Elko struck back in the sixth as Derek Ridgway was hit by a pitch by Ty Vaio and pinch runner Cody Nielsen swiped second base. With two outs, the Wolverines issued an intentional walk to Tommy Headley. Cody Kerns smacked the ball to second, but the Truckee defense could not make the play, and Nielsen scored from second to tie the score. Ridgway was in control from there as he held the Wolverines hitless the rest of the way. The senior finished with six strikeouts and allowed four runs on four hits and a walk. With the score tied entering the bottom of the seventh, Justin Pete opened the inning with a double off of Vaio. Pado then came in to relieve Vaio, and three pitches later Connor Gallagher came through with the winning RBI. The Wolverines led most of the way against Lowry on Friday afternoon. They scored four runs in the first inning and two more in the third to chase starter Aaron Nelson, who gave up 10 runs (nine earned) on nine hits and five walks in 4 1/3 innings. Truckee led 6-3 after three innings and 11-5 after a five-run top of the fifth. Lowry tightened the score with a four-run bottom of the fifth, but Pado was able to close the door in relief. Riley Guiragossian started for Truckee and allowed nine runs (six earned) on 10 hits and two walks in four innings, striking out three. Pado fanned four hitters over the final three innings and gave up three hits and a walk. The Wolverines amassed 12 hits, with Andy McKechnie going 3-for-5 with a double and RBI, Teagan Pado going 2-for-4 with a double and RBI, and Holmer going 2-for-5 with two RBIs. Rohlf and Aaron Pado each drove in two runs on one hit, while Thor Retzlaff and Ferre each contributed an RBI. After staving off elimination against Lowry, Truckee had to do it all over again Saturday morning, this time as the visiting team against Fallon. The game was a back-and-forth barn burner from start to finish, with the teams swapping leads on several occasions. The score was tied 3-3 after two innings, while Truckee took a 4-3 lead with a run in the fourth, Fallon went ahead 5-4 with a two-run bottom of the fourth, and Truckee regained the lead, 6-5, with a two-run fifth. After Fallon pulled even with a run in the bottom of the fifth, the Wolverines created what they hoped was some breathing room with three run in the sixth, but once again the Greenwave rallied in the bottom half, scoring two runs to bring the score to 9-8. Neither team scored in the seventh, and the Wolverines held on for the nerve-wracking win. Aaron Pado earned the save in an inning and two-thirds as Truckee used four different pitchers in the game — Towle, McKechnie, Branden Deeter and Pado. Truckee managed 15 hits off of Lowry’s three different pitchers — Hunter Mori, Morgan Dirickson and Cody Long — with Ferre leading the way with a 3-for-4 game with three RBIs. Teagan Pado and Holmer each had two hits and two RBIs, while Rohlf, Aaron Pado and Retzlaff each had two hits. Having already secured a spot in the state championship tournament, the Wolverines entered the regional final against Elko with few pitchers available. The Indians, who had played only two games to the Wolverines’ three, took advantage, scoring three runs in the first inning, two more in the second, six in the third and two in the fourth. Truckee got on the board with two runs in the third as the game ended after five on the 10-run mercy rule. The Wolverines managed three hits off of a trio of Elko pitchers, one apiece by Towle, McKechnie and Rohlf, who also added an RBI. Elko Daily Free Press Sports Editor Martin Harris contributed to this report.